Fixed price allowances can be a useful way of establishing emissions trading gradually. I have previously looked at the relative advantages of carbon taxes and emissions trading systems (ETSs), including in the videos on this site. Among the drawbacks of emissions trading systems is that they tend to be more complex to administer than carbon taxes. An emissions trading system requires surrender of allowances, which need to be issued, often by both auction and free allocation, and tracked as they are traded. There is a range of administration needing for this, including maintaining a registry of allowances and ownership. In contrast, a tax simply requires a payment to be made per tonne emitted. The administrative cost of emissions trading is unlikely to be a significant proportion of the costs of a system for a large jurisdiction with high administrative capacity, for example the EU. However it can be daunting for smaller jurisdictions with more limited administrative capacity. Even a large jurisdiction may be concerned about the time needed to establish an emissions trading system. There may also be concern about the economic the risks. For example, there will always be uncertainty about price when the cap is first set. These difficulties can be reduced by including an initial phase of fixed price allowances. Under this approach emitters pay a fixed price per tonne. However rather than simply paying a tax they are required to surrender allowances. An unlimited number of allowances is available from the regulatory authorities at a fixed price. This approach has the advantage that it puts in place much of the administrative infrastructure necessary for emissions trading. Allowances are issued and a registry is established. From there it is a more straightforward path to limiting the number of allowances to impose a cap, and allowing them to be traded. It has the further advantage that it can introduce a carbon price, perhaps gradually through and escalating price, and the effect of this can be assessed when setting a subsequent the cap. The additional information can further reduce risks. This approach of issuing fixed price allowances was implemented in Australia, starting in 2012. An initial 3 year phase was originally planned with emitters required to surrender allowances. An unlimited number of allowances was available each year at a fixed price. This was AU$23/tonne in the first year, escalating at 2.5% plus the rate of inflation each year. This was intended to be followed by a transition to an emissions trading system with a cap and a price floor. The chronology in practice was as follows. Legislation to introduce carbon pricing was passed in 2011. The fixed price came into effect ion 1st July 2012, with unlimited allowances available at AU$23/tonne. Full trading was originally scheduled to being in 2015. In 2013 it was announced this would be brought forward a year to 2014. However this did not happen, as the incoming Abbott government, which took office in September 2013, repealed the carbon pricing scheme with effect from July 2014. In the Australian political context that prevailed at the time the similarity to a tax was seen as a drawback politically. It allowed the opposition to label it a tax, which the previous government had committed not to introduce. A very sensible approach was therefore abandoned. However this was a feature peculiar to Australian politics at the time, and not a more general problem. The EU and the Western Climate Initiative have both shown that it is possible to establish emissions trading systems directly, without the need to go through an initial fixed price phase (the WCI systems were delayed by a year from their originally intended start date, but have generally worked well since). And some jurisdictions will choose a tax in any case. Nevertheless, if there is a desire to put an ETS in place in a way which lowers the initial administrative burden and some of the risks of establishing an ETS, then transitioning to an ETS through issuing fixed price allowances can be a valuable approach. This entry was posted in carbon price floor, carbon pricing, carbon taxes, climate change, Climate change policy, emissions targets, emissions trading and tagged carbon pricing, carbon taxes, climate change, climate change policy, emissions trading, emissions trading scheme, EUETS, floor prices on 13/06/2018 by adamwhitmore. The auction reserve price in California has proved successful in maintaining a minimum carbon price. However it shows the importance for an emissions trading system of political commitment and stability. This is the second of two posts looking at experience of carbon price floors. My previous post looked at UK carbon price support, which guarantees a minimum price by means of a tax. This post looks at an alternative approach, which is used in California and the other Western Climate Imitative systems, Quebec and Ontario. Here, instead of imposing a tax, the floor is set by specifying a reserve price in auctions of allowances. If bids in auctions stay below the reserve price the allowances are not sold. Reserve prices such as this are common in practice in many commercial auctions, including those held by major auction houses and online. Reserve prices give what is often called a “soft” floor. The market price can go below the auction reserve, but eventually the need to buy allowances at auction is likely to ensure that the price recovers. 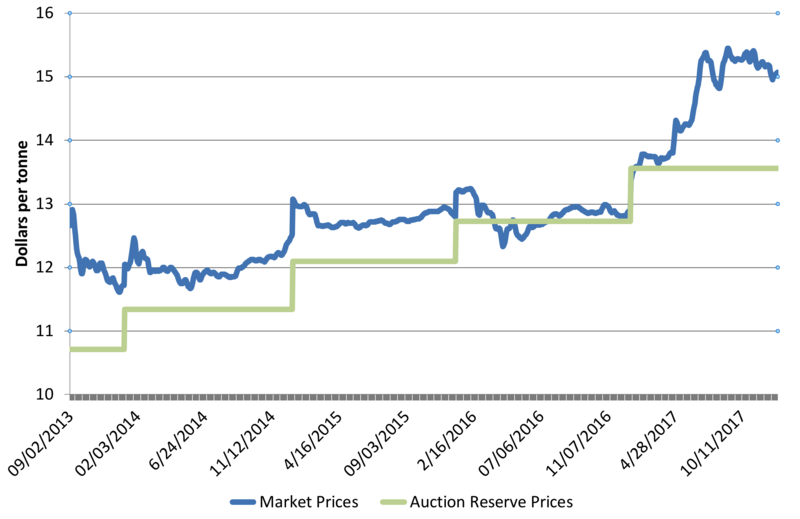 The chart below shows the auction reserve price in the California system (green line), which started at $10/tonne in 2012 and is increased each year by 5% plus the rate of inflation. The California market price (blue line) has generally stayed above this level. However it did dip below the reserve price for a while in 2016, illustrating that the floor is soft. This price dip reflected a combination of legal challenges to the system, and political uncertainty about the continuation of the system after 2020, which together reduced the demand for allowances. Once those uncertainties were resolved the market price recovered. The Regional Greenhouse Gas Initiative (RGGI) has similar arrangements but with a much lower reserve price, and there too the price has been above the floor. The environmental effectiveness of price containment mechanisms depends in large part on what eventually happens to any unsold allowances. In the case of California this issue particularly affects the upper Price Containment Reserve, from which allowances are released if prices go above defined thresholds. Allowances from this reserve appear most unlikely to be required in the current phase, as prices seem highly unlikely to reach the threshold levels. If these unsold allowances in the reserve are cancelled, or otherwise put beyond use, cumulative emissions will be lower. However if they eventually find their way back into the system, and enable the corresponding quantity of emissions to take place, the environmental benefit may not be realised, or at least not it full. Some sort of cancellation mechanism is therefore needed, for example cancelling allowances that have been in the reserve for more than a specified number of years. So price floors can work, however in the case of the California system at least two things need to be agreed as the rules for the system after 2020 are debated this year. First, continuation of the escalation of the floor price needs be confirmed at least at the current rate, and ideally the rate should be increased. Secondly, rules for cancelling unsold allowances from the Price Containment Reserve need to be defined. The cancellation of allowances from the Market Stability Reserve included in the recent reforms to the EUETS sets a valuable precedent in this respect. The theoretical advantages of a floor price in an ETS are well known. The experience of auction reserve prices now proving effective in practice over a number of years should encourage other jurisdictions, especially the EU, to introduce similar arrangements. And those jurisdictions such as California where they are already in place need to continue to develop and enhance them. This entry was posted in carbon price floor, carbon pricing, carbon taxes, climate change, Climate change policy, emissions targets, emissions trading, greenhouse gas emissions, international comparisons and tagged carbon pricing, carbon taxes, climate change, climate change policy, decarbonisation, emissions targets, emissions trading, emissions trading scheme, EUETS, floor prices on 15/02/2018 by adamwhitmore. The UK carbon tax on fuel for power generation provides the most clear-cut example anywhere in the world of large scale emissions reductions from carbon pricing. These reductions have been achieved by a price that, while higher than in the EU ETS, remains moderate or low against a range of other markers, including other carbon taxes. The carbon price for fuels used in power generation in the UK consists of two components. The first is the price of allowances (EUAs) under the EUETS. The second is the UK’s own carbon tax for the power sector, known as Carbon Price Support (CPS). The Chart below shows how the level CPS (green bars on the chart) increased over the period 2013 to 2017[i]. These increases led to a total price – CPS plus the price of EUAs under the EUETS (grey bars on the chart) – increasing, despite the price of EUAs remaining weak. This increase in the carbon price has been accompanied by about a 90% reduction in emissions from coal generation, which fell by over 100 million tonnes over the period (black line on chart). Various factors contributed to this reduction in the use of coal in power generation, including the planned closure of some plant and the effect of regulation of other pollutants. Nevertheless the increase in the carbon price since 2014 has played a crucial role in stimulating this reduction in emissions by making coal generation more expensive than gas[ii]. According to a report by analysts Aurora, the increase in carbon price support accounted for three quarters of the total reduction in generation from coal achieved by 2016[iii]. The net fall in emissions over the period (shown as the dashed blue line on chart) was smaller, at around 70 million tonnes p.a. [iv] This is because generation from coal was largely displaced by generation from gas. The attribution of three quarters of this 70 million tonnes to carbon price support implies a little over 50 million tonnes p.a. of net emission reductions due to carbon price support. This is equivalent to a reduction of more than 10% of total UK greenhouse gas emissions. The financial value of the reduced environmental damage from avoiding these emissions was approximately £1.6 billion in 2016 and £1.8 billion in 2017[v]. The UK tax has thus proved highly effective in reducing emissions, producing a substantial environmental benefit[vi]. As such it has provided a useful illustration both of the value of a floor price and more broadly of the effectiveness of carbon pricing. This has been achieved by a price that, while set at a more adequate level than in the EU ETS, remains moderate or low against a range of other markers, including other carbon taxes. CPS plus the EUA price was around €26/tCO2 in 2017 (US$30/tCO2). The French the carbon tax rose from €22/tCO2 to €31/tCO2 over 2016-2017. In Canada for provinces electing to adopt a fixed price the carbon price needs to reach CAN$50/tCO2 (€34/tCO2) by 2022[vii]. These levels remain below US EPA 2015 estimates of the Social Cost of Carbon of around €40/tCO2 [viii]. This type of low cost emissions reduction is exactly the sort of behaviour that a carbon price should be stimulating, but which is failing to happen as a result of the EU ETS because the EUA price is too low. More such successes are needed if temperature rises are to be limited to those set out in the Paris Agreement. This means more carbon pricing should follow the UK’s example of establishing an adequate floor price. This should include an EU wide auction reserve for the EUETS. The reserve price should be set at somewhere between €30 and €40/t, increasing over time. This would likely lead to substantial further emissions reductions across the EU. [iv] Based on UK coal generation estimated weighted average emissions intensity of 880gCO2/kWh, and 350gCO2/kWh for gas generation. [v] 50 million tonnes p.a. at a social cost of carbon based on US EPA estimates of $47/tonne (€40/tonne). [vi] There is a standard objection to a floor in one country under the EUETS is that it does not change of the overall cap at an EU level so, it is said, does not decrease emissions. However this does not hold under the present conditions of the EUETS, and is unlikely to do so in any case. 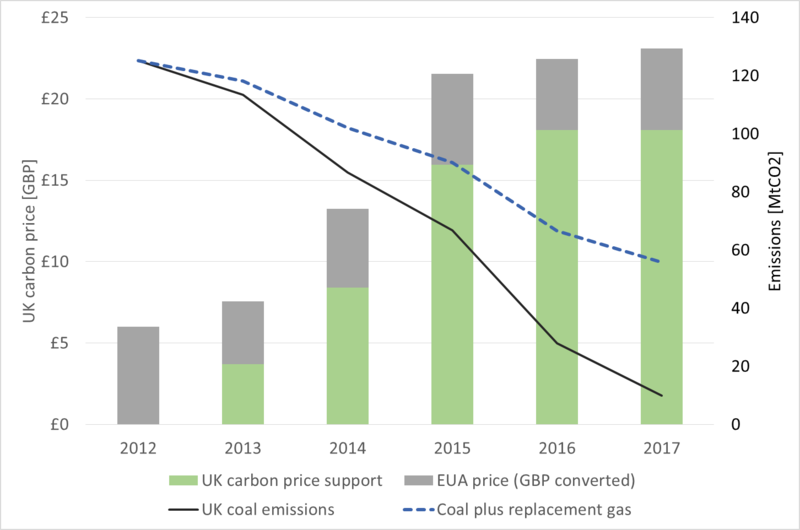 A review of how emissions reductions from national measures, such as the UK carbon price floor, do in fact reduce total cumulative emissions over time is provided was provided in my recent post here. [vii] The tax has now set at a fixed level of £18/tonne. It was previously set around two years in advance, targeting a total price comprising the tax plus the EUA price. There was no guarantee that it would set a true floor price, as EUA prices could and did change a good deal in the interim. Indeed, in 2013 support was set at £4.94/tCO2, reflecting previous expectations of higher EUA prices, leading to prices well below the original target for the year of £16/tCO2 in 2009 prices (around £17.70 in 2013 prices). See https://openknowledge.worldbank.org/handle/10986/28510?locale-attribute=en. The price is also below the levels expected to be needed to meet international goals (see section 1.2), and below the social cost of carbon as estimated by the US EPA (see https://onclimatechangepolicydotorg.wordpress.com/carbon-pricing/8-the-social-cost-of-carbon/ and references therein). [viii] Based on 2015 estimates. This entry was posted in 2050 targets, carbon price floor, carbon pricing, carbon taxes, climate change, Climate change policy, emissions targets, emissions trading, greenhouse gas emissions, Paris Agreement, power generation and tagged carbon pricing, climate change, climate change policy, decarbonisation, emissions targets, emissions trading, emissions trading scheme, EUETS, floor prices, long term emissions targets, Paris Agreement, power generation, social cost of carbon on 17/01/2018 by adamwhitmore. Can emissions trading produce adequate carbon prices? Prices under emissions trading schemes have been low to date. Sometimes this may be because systems are new, but the EUETS is long established and needs to demonstrate that it can now produce adequate prices. Prices under emissions trading systems around the world have so far remained low. The chart below shows carbon pricing systems arranged in order in increasing price, with prices on the vertical axis shown against the cumulative volume covered on the horizontal axis. Carbon taxes are shown in purple, emissions trading systems in green. It is striking that all of the higher prices are from carbon taxes, rather than emissions trading systems. Source: World Banks State and Trends of carbon pricing report. Prices are from mid-2016. Prices in the largest emissions trading system, the EUETS have been around $5-6/tonne, and prices in the Chinese pilot schemes have been similar and in some cases even lower, although with little trading. The price under the California and Quebec scheme (soon to be joined by Ontario) is somewhat higher. However, this is supported by a floor set in advance and implemented by an auction reserve price. If this price floor were not present a surplus of allowances would very likely have led to lower prices. The Korea scheme has had very low trading volumes, so does not provide the same sort of market signal found under more liquid schemes. 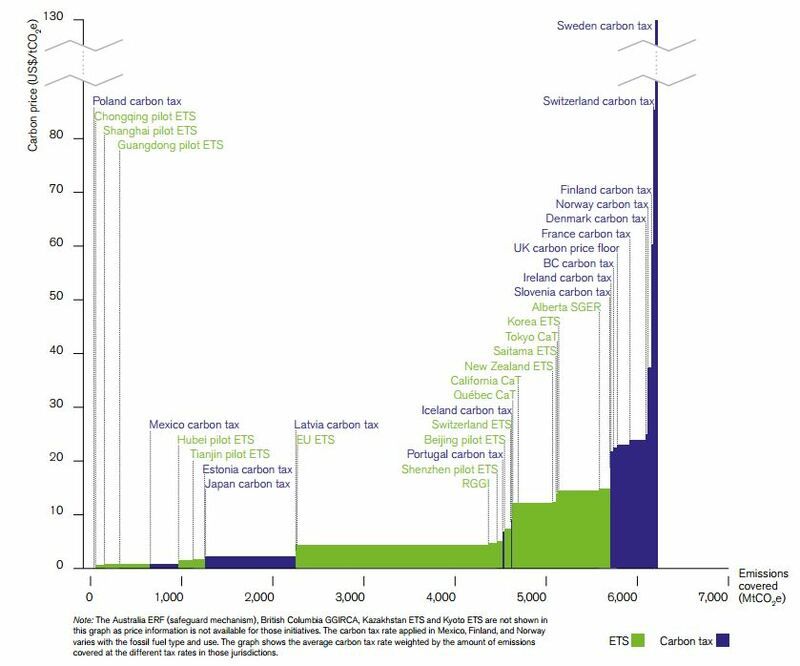 In contrast, a wide range of carbon taxes are already at higher levels and in some cases are due to increase further. The French carbon tax, which covers sectors of the economy falling outside the EUETS, is planned to reach €56/tCO2 (US$62/tCO2) in 2020 and €100/tCO2 (US$111/tCO2) in 2030. In Canada a national lower limit on carbon prices for provinces with an explicit price-based system (not shown on the chart) is due to reach $50 per tonne in 2022. The UK carbon price floor, which covers power sector emissions, was due to rise to substantially above current levels, but is currently being kept constant by the Government, mainly because the price under the EUETS is so low. Increases such as those due in France and Canada will bring some carbon taxes more in line with the cost of damages, and thus to economically efficient prices. The cost of damages is conservatively estimated at around $50/tonne, rising over time (see here for a discussion of the social cost of carbon and associated issues). The increases will also bring prices more into line with the range widely considered to be necessary to stimulate adequate low carbon investment. Low prices under emissions trading systems have been attributed to a range of factors, including slower than expected economic growth and falling costs of renewables. However these factors do not explain the consistent pattern of low prices across a variety of systems over different times. While it is difficult to derive firm evidence on why this pattern should be present, two factors seem plausible. The first is systematic bias in estimates – industry and governments will expect more growth that actually occurs, costs will be overestimated, and these tendencies will be reflected in early price modelling, which can often overstate likely prices. But the second, more powerful, tendency appears, based on anecdotal evidence, to be that there is an asymmetry of political risk. The political costs of unexpectedly low prices are usually perceived as much less than those of unexpectedly high prices, and so there will always be tendency toward caution, which prevents tight caps, and so leads to prices being too low. This tendency is difficult to counteract, and has several implications for future policy. First, it further emphasises the value of price floors within emissions trading systems. Traditional environmental economics emphasises the importance of uncertainty around an expected level of abatement costs or damages. If decision makers are not in fact targeting expected average levels, but choosing projections of allowance demand above central expectations then the probability of very low prices is increased, and the case for the benefits of a price floor is stronger. Second, it implies that it is even less appropriate than would anyway be the case to expect the carbon price alone to drive the transition to a low carbon economy. Measures so support low carbon investment, which would in any case be desirable, are all the more important if the carbon price is weak (see here for a fuller discussion of the value of a range of policy measures). While additional measures do risk further weakening the carbon price, they should also enable reduced emissions and tighter caps in future. Third, it requires governments to learn over time. Some low prices may reflect the early stage of development of systems, starting slowly with the intention of generating higher prices over time. However this does require higher prices to eventually be realised. The EUETS has by some distance the longest-established system, having begun eleven years ago and with legislation now underway for the cap to 2030, by which time the system will be 25 years old. The EU should be showing how schemes can be tightened over time to generate higher prices. However it now looks as though the Phase 4 cap will be undemanding compared with expectations (see previous posts). The recent vote by the European Parliament’s ENVI committee failed to adopt measure that are adequate to redressing the supply demand balance, with tweaks to the market stability reserve unlikely to be enough. This undermines the credibility of cap-and-trade systems more generally, rather than setting the example that it should. Further reform is needed, including further adjustments to supply and preferably auction reserve prices. The advantages of cap-and trade systems remain. Quantity limits are in line with the international architecture set by the Paris Agreement. They also provide a clear strategic signal that emissions need to be reduced over time. However there is little evidence to date that emissions trading systems can produce adequate prices. The EU, with by far the most experience of running an ETS, should be taking the lead in substantially strengthening its system. At the moment this leadership is lacking. Wider efforts to tackle climate change are suffering as a result. World Bank State and Trends in Carbon Pricing 2016. See link in reference 1.
 http://news.gc.ca/web/article-en.do?nid=1132169 Canadian provinces with volume based schemes such as Quebec with its ETS must achieve emissions reductions equivalent to these prices. $40/tonne in $2007, see https://www.epa.gov/climatechange/social-cost-carbon, escalated to about $50 today’s dollars. The South Korea ETS may be a partial exception to the pattern. However it is unclear due to the lack of liquidity in the market. This entry was posted in carbon price floor, carbon pricing, carbon taxes, Climate change policy, emissions trading, international comparisons and tagged carbon pricing, carbon taxes, climate change, climate change policy, decarbonisation, emissions trading, emissions trading scheme, EUETS, floor prices, social cost of carbon on 23/01/2017 by adamwhitmore. Standard objections to introducing price containment mechanisms into the EUETS carry little weight. It’s time to give price containment more serious consideration. With the price of allowances in the EUETS currently down at around €4/tCO2 the question of whether direct price containment (price floors and ceilings) should be introduced has naturally been the subject of renewed debate, especially in the light of the French proposal earlier this year to introduce a price corridor. The debate tends always to feature a standard set of objections to price containment. Most of these lack validity when applied to well-designed mechanisms. Here I take a look at why this is so, in the hope that the debate can become more realistic and constructive, focusing on the benefits and design challenges around price containment. All emissions of GHGs are damaging, not just those above the cap. Reducing emissions below the cap and further tightening the cap thus have benefits. The financial cost of damages emissions (the social cost of carbon – SCC), although uncertain, is well above current prices. This implies that further emissions reductions with a cost between the current price and the cost of damages have a net benefit. However these are not currently being incentivised by the carbon price. This is one reason why a floor prices is beneficial. The market structure and parameters are set by regulatory decisions. These decisions are inevitably taken under uncertainty, and market design is about optimising outcomes under uncertainty. Design is more robust to uncertainty with both price and quantity targets than with either alone. Supply adjusting in response to price makes the EUETS more like a normal market. It is essential for reasons of international obligations and environmental integrity that the cap is maintained, so moving to a pure carbon tax is not a good idea. Based on these premises the following responses to standard objections to price management can be made. The form of the market is a politically determined construct. Modifications to this construct are appropriate to correct shortcomings in the current design, where supply is too rigid to accommodate uncertainties. The cap does succeed in limiting the total emissions but fails to produce adequate signals for additional abatement. Modification is required to reduce supply of allowances if prices become too low, in order to retain efficient price signals. Allowing the supply of allowances to respond to price is not interfering with the day-to-day operation of the market. On the contrary, it is designing it to function more like a normal market. In most markets supply varies with price (elasticity of supply is not zero in most markets). The critical question here is what happens to unsold allowances. There are many possibilities for dealing with unsold allowances, including cancelling them at the end of a phase, cancelling a proportion at the end of a phase, or cancelling them on a rolling basis. Provided that there are appropriate provisions for cancelling unsold allowances, total emissions over time can be reduced, and so there is a clear environmental benefit. Even if this is not the case, allowances may simply stay in the reserve, or caps may be tighter in future due to emissions reductions achieved, also creating an environmental benefit. No it should not. The low price signals that the target is not stringent enough to adequately reflect damages. All emissions are damaging, even those within the cap, and if more abatement can be achieved at lower cost than the damage caused this is what should happen. Measures which further decrease emissions in response to lower cost of abatement also help reinforce the EU’s international leadership position on climate change. Prices can managed by automatically adjusting supply in response to price, for example by putting a reserve price in auctions. This is entirely consistent with the quantity based nature of the EUETS, in that it works by adjusting quantity. Indeed, as noted, it makes the EUETS more like almost all other markets where the quantity of supply varies in response to market prices. It is possible to use tax-based measures to impose a floor, as the UK does and France will do from January 2017, but it is not necessary to do so. Characterising price floors as a tax appears often to be used as a way of creating political momentum against the idea. An EU tax requires unanimity among Members States and attempts to introduce a carbon and energy tax in the 1990s were notably unsuccessful, and similar efforts would doubtless prove challenging. Characterising floors as a tax may also help develop political opposition to a floor. Branding the Australian ETS as a tax (which it was not) was successful in helping build opposition there, with eventual repeal of the scheme. Price management through adjusting quantities should not be misrepresented in this way to artificially discredit it. This confuses efficiency of trading with efficiency of the price signal. If you were never to change the number of allowances, trading alone might indeed remain the most efficient way of meeting the cap. However this has created prices which failed to adequately signal efficient abatement (in effect the market is telling you that the current cap is too loose). There is thus a misallocation of resources towards to many emissions and too little abatement. Having both price and quantity limits increases robustness to the unexpected. If the cap has been set at appropriate levels then prices will anyway lie within the range of any price containment, and price limits will not bind. However the existing EUETS cap has been set at a sub-optimal level –too many allowances have been issued and the price is too low. Limiting the price simply recognises that future demand for allowances may be mis-estimated, or the level of the cap may be subject to biases, for example due to asymmetries of political risk from setting the cap too high or too low. estimates of the SCC, which represents the financial cost of damages, although calcualtions typically exclude important costs of damage. The SCC is highly uncertain, but well above the €4/tonne currently prevailing in the EUETS under almost any reasonable set of assumptions. prices consistent with those needed to signal abatement sufficient to reach climate targets. This gives a framework of negotiation. The level of the cap, which is always set with a view to abatement costs and prices, is anyway contentious. There are many difficult issues to resolve in designing appropriate price containment mechanisms for the EUETS and setting price boundaries at appropriate levels. Spurious objections such as the ones discussed here should not be allowed to form an obstacle to much-needed debate about the best way forward. Note: The advantages of hybrid price quantity instruments have been extensively reviewed in the environmental economics literature, going back to the original paper on the subject by Roberts and Spence Effluent Charges and Licenses Under Uncertainty (1976). Understanding the need for prices to fully reflect the cost of environmental damages goes back further, to Pigou “The economics of welfare” (1920). See standard texts on environmental economics for a fuller treatment. These conclusions are not uncontentious, in particular because some observers continuing to favour a carbon tax. My own view remains that including a cap on emissions is preferable, and that many of the advantages of a carbon tax can be realised by a well-designed floor price. Furthermore there are other non-priced damages which imply the benefit of abatement is greater than implied by the SCC. Also, any ceiling should be soft to allow prices to rise above the ceiling rather than allowing emission to go above the cap, for example with allowances in price containment reserve taken from within the cap. Almost the only markets with completely fixed supply are the markets for tickets to major sporting events and for authentic works by dead artists. For example the number of tickets to the men’s final at the Wimbledon tennis championships is limited by the number of seats, and the number of authentic Picasso’s cannot now increase with price (although the number of fakes can). This entry was posted in carbon price floor, carbon pricing, carbon taxes, Climate change policy, emissions trading and tagged carbon pricing, carbon taxes, climate change policy, emissions trading, emissions trading scheme, EUETS, floor prices, social cost of carbon on 14/09/2016 by adamwhitmore. Mechanisms that limit prices under an ETS (price floors and price ceilings) are already in operation in North America. Similar arrangements can easily be adopted elsewhere, including in the EU. In previous posts I have alluded to the benefits for an ETS of price floors in the form of auction reserves and soft ceilings in the form of a price containment reserve taken from within the cap. In this post I take a look at how such arrangements work in North America to demonstrate that they are not esoteric theoretical ideas, but existing practice that can easily be adopted in similar form in the EU or elsewhere. California, Quebec and the Regional Greenhouse Gas Initiative (RGGI) have a soft price floor in the form of an auction reserve price. Prices can fall below this floor, but if bids are below this level in the auction allowances are not sold, so supply quickly tightens to maintain the price at the floor. When prices rise, allowances can be released from a reserve acting reducing upward price pressure, although California and RGGI differ in the extent to which allowances additional to the cap can be offered into the market. They also have mechanisms to limit price rises in the form of allowance reserves, but differ in the extent to which additional allowances can enter the market. Under the California ETS (Quebec has very similar arrangements) there is an auction reserve price of $10/tonne in 2012, which rises at 5% p.a. plus an inflation adjustment, and is currently $10.71/tonne. Any allowances that are not sold at auction are retained by the regulator, the Air Resources Board (ARB), in an Auction Holding Account. The holding account allowances are not made available again through the auction until the price has exceeded the floor price for two consecutive quarterly auctions, and return is subject to a limit of 25% of the total allowances available at each regular quarterly auction. As a result, a surplus in the Auction Holding Account may take time to be drawn down. In practice all 2013 allowances were sold out at the first four auctions, and the market price is above the floor level, though only by a little in the first auction. RGGI, which covers power sector emissions from several states in the north eastern USA, also includes an auction reserve price. However, the reserve price is much lower than in California, at $2/short ton in 2014 rising at 2.5% p.a., approximately in line with inflation. In the past the floor has often been binding, but the current price is above the floor. Allowances unsold at auction prior to 2014 are retained by the authorities and can be auctioned again, but allowances unsold at the end of each 3 year control period (the current control period is 2012-2014) may be retired permanently at the discretion of individual states. This gives a possible mechanism for automatically tightening the cap if there is a surplus allowances at the floor price over an extended period. In California there is an Allowance Price Containment Reserve (APCR) from which allowances are released at prices of $40, $45, and $50/tonne in 2013, rising at 5% p.a. plus inflation thereafter. This is entirely separate from the Auction Holding Account used for the floor. Allowances are sold from the APCR on a quarterly basis if there is demand. The sale is held six weeks after the regular quarterly auction of allowances, allowing buyers to make up a shortfall after the auction. Buyers specify the number of allowances they want at any of the three fixed prices. 122 million allowances have been put into the APCR for the period to 2020 equal to 4.5% of the overall cap across all years (including the maximum allowed offsets), and relative to a single year (2015) is 29% of the cap including the maximum allowed offsets. The APCR allowances are taken from within each year’s capped total. The reserve is divided equally among the three price tiers. ARB has proposed that the number of allowances in the APCR be increased to 207 million tonnes, which would be 7.6% of the overall cap. Similar arrangements could readily be made for the EUETS. A price containment reserve of the same proportion of the 1013-2020 cap as Californian (4.5-7.6% of the total cap for Phase 3 excluding aviation) would be approximately 690 to 1170 million allowances, very much in line with the quantities that have been discussed for set-aside or backloading. A market stabilisation reserve would be, in effect, somewhere between backloading and permanent set aside. This is because allowances placed into the stabilisation reserve could potentially return to the market (in contrast to permanent set-aside). However, they would do so only in response to prices reaching threshold levels, rather than automatically (as is intended with backloading). This type of reserve could be accompanied by an auction reserve price to stabilise the price at the lower end of the range. Some in the EU continue to oppose price containment mechanisms. Whatever objections may be advanced against price containment – and none seem compelling to me in principle, at least for an auction reserve price – a lack of practical examples elsewhere on which to draw is certainly not one of them. This entry was posted in carbon price floor, carbon pricing, emissions trading and tagged carbon pricing, emissions trading, emissions trading scheme, floor prices on 02/10/2013 by adamwhitmore. Estimates of the social cost of carbon can help set floor prices in emissions trading schemes. Estimates are likely to suggest a floor price for the EUETS of around €20-30/tCO2, rising over time. (Note: for a discussion on the social cost of carbon itself see the page on this issue under carbon pricing). Those arguing against any price management in the EUETS sometimes suggest that, first, there is nothing wrong with the currently low level of prices, as it simply means that targets have been met at low cost, and, second, that there is no objective basis for setting the level of a floor price. However neither of these propositions is valid. We can be fairly sure that current prices in the EUETS are too low because prices are below the bottom end of the range of estimates for the damage caused by emissions – the social cost of carbon (SCC) – and so violate the principle that the externality of environmental damage should be fully included in the marginal price of emissions. The emissions reduction target to 2020, an inevitable trade-off between costs and benefits, was, with hindsight, insufficiently ambitious. And the SCC provides an objective, non-arbitrary method for setting a price floor, although inevitably the quantification is subject to uncertainties. Estimating the SCC involves many uncertainties about the nature, extent and cost of damages, and the value that should be placed on non-market effects, including many changes to ecosystems. These uncertainties are compounded by the damage being determined by the stock not the flow of GHGs, and even by the cumulative effect of the stock over time, with effects depending on how long a given concentration of GHGs is present in the atmosphere. Furthermore the effects of changing the stock are likely to be highly non-linear effects. There is also considerable uncertainty about the discount rate that should be used in weighting current and future costs, and the adjustments necessary to account for effects across people at very different levels of income (equity weighting). These uncertainties lead to a wide range estimates of the SCC. The US Environmental Protection Agency (EPA) has recently published new estimates of the SCC. These are intended for use is assessing the cost effectiveness of policies such as fuel efficiency standards for vehicles. Because many damages are large but occur in the distant future the choice of discount rate has a particularly large effect on the results, so the results are presented for a range of discount rates. Values in $2011 range from $12 to $117/tCO2 in 2015 (around 2013€9.50- €92/tCO2) rising over time by roughly 2% p.a. in real terms. This range, covering an order of magnitude, is fairly typical of surveys of the SCC, though some have argued for much higher values, and a few for lower values. There are some who have argued that the uncertainties are so great that such analysis is all but useless for policy making. However this seems to go too far. Although wide, this range is a useful guide for decision making because it gives guidance for appropriate minimum levels for the carbon price, demonstrating clearly that the current EUETS price is almost certainly below the cost of the damage caused by emissions of greenhouse gases. These estimates can thus act as useful markers for the level of floor price that should prevail under the EUETS. Indeed at a 3% discount rate the SCC estimate for 2020 of $46/tCO2 is quite close to the target UK carbon price floor of £30/tCO2. Many of the limitations of the modelling suggest that there are good reasons to suppose that any floor price should be higher than the bottom end of the range of estimates. First, such a low estimate follows from the application of a constant, continuously compounded discount rate of 5%. It is likely to be more appropriate to use a discount rate that falls over time, which would reduce the effect of discounting and so increase the estimated SCC towards the higher values in the table. A workshop held by the EPA acknowledges this as a consensus view, and that this approach is the adopted by the UK and France. Second, the lower estimates of the SCC also exclude some effects, and fail to take adequate account of some high impact events (upper tail of the distribution). Even the higher estimates will often exclude material damages . Inclusion of these would lead to higher damage estimates. Indeed, the discontinuities raise fundamental challenges to the concept of marginal damage from a tonne of emissions. Furthermore, even for those damages that are included models used to estimate the costs of damages may not yet include the latest evidence on impacts, which in many cases suggests higher levels of damage. Underestimates of damages are likely to be especially large at high temperature changes. On balance it thus seems likely that an optimal floor price is above the bottom of the range shown by the EPA, perhaps around the value for a 3% discount rate of around $40/tCO2 (€30/tCO2), although a case for higher numbers can readily be made. However corresponding EU analysis would be likely to be required in practice to underlie the setting of any floor price level, and pragmatic considerations may lead to the choice of a value below this, perhaps in the range €20-30/tCO2. It may be desirable to converge to this level over a few years in practice to prevent significant price discontinuities. This would of course need to be accompanied by adequate shielding for sectors at risk of carbon leakage. If the price of EUAs were to rise towards the top of the range of estimates for the SCC then it may imply that some abatement would be more expensive than the damage caused by the emissions, and so would not be warranted on grounds of economic efficiency. This may suggest the need for a price ceiling at around this level. However, the case for this is much less clear-cut than for the lower bound, due to the possible presence of the discontinuities, high impact events, and non-market costs already alluded to. This may imply that only a higher ceiling price, or even no ceiling price at all, is appropriate if this takes the form of unlimited additional allowances being made available (fuller discussion of this point, including how it relates to abatement efforts elsewhere as well as the political economy dimension, will need to await another post). However the upper end of the range of SCC estimates may at least form a marker for an appropriate price at which to release allowances held in a price containment reserve of allowances taken from within the cap, such as that found in California, providing a “soft” ceiling until the reserve is exhausted. The California and Quebec schemes have floor prices approximately consistent with the range of SCCs, with price floors at $10/ tCO2. Although a little below the estimates shown in the table this is indexed at 5% real p.a., and so will quickly converge with the levels shown if this indexation is retained. However RGGI has a price floor (around $2/short ton) that looks much too low by this metric, with a strong case for a substantial increase. Estimates of the SCC may be uncertain, but they nevertheless represent a useful way of putting at least a lower bound on the price in an ETS. The use of uncertain estimates is better than allowing the price to fall to close to zero, a price which is surely wrong. And it is likely that estimates of the SCC in a European context would imply a floor prices well above current EUETS prices. The marginal price signal is at too low a level, so some economically efficient abatement is not being signalled. It is possible that an inefficient mix of abatement is being purchased, even though the level of abatement is efficient. This could be the case if, for example, there was too much expensive abatement through renewables programmes. In this case the appropriate response would be to reduce the expensive abatement under other programmes, in which case the price floor in the ETS would still be appropriate but might not bind. Alternatively, renewables programmes may recognise the presence of other market failures, notably those associated with failure to recognise spill-over effects from innovation, and the policies in place are appropriate. In this case the cap is too loose. Some mix of these explanations is of course possible, although the latter seems the more plausible. In either case a floor to maintain an efficient marginal price signal remains appropriate. Comparing estimates of the SCC from different sources presents a number of difficulties, including the currency and year in which the estimates are quoted (US$ 2011 here), the date of the estimates and the assumptions made, all of which are sometimes unclear. However, most estimates seem to imply values roughly within the US EPA range. For a discussion of a variety of issues see: https://www.gov.uk/government/uploads/system/uploads/attachment_data/file/42502/sei-scc-report.pdf. Also see: L. Johnson and C. Hope, “The social cost of carbon in U.S. regulatory impact analyses: an introduction and critique” Journal of Environmental Studies and Sciences. September 2012, Volume 2, Issue 3, pp 205-221. More recent work by C. Hope and M. Hope (“The Social cost of CO2 in a low growth world” Nature Climate Change, August 2013) points out that with lower growth estimates of the SCC rise as future generations are correspondingly poorer (essentially this is an aspect of the discount rate issue). A few calculations by others in the past have produced very low and even occasionally negative values for SCC (implying GHG emissions are beneficial), due, for example, to increased agricultural productivity, but these do not seem a plausible reflection of current circumstances and understanding. See http://www.epa.gov/climatechange/EPAactivities/economics/scc.html and links therein. See http://web.mit.edu/rpindyck/www/Papers/Climate-Change-Policy-What-Do-the-Models-Tell-Us.pdf The author argues that the assumptions, especially on the damage function, cannot be sufficiently robust to base conclusions on. However he acknowledges the pragmatic value of such results as a possible marker for a carbon price. For estimates giving higher values see: http://www.e3network.org/papers/Climate_Risks_and_Carbon_Prices_executive-summary_full-report_comments.pdf, which explicitly critiques the US EPA analysis. This entry was posted in carbon price floor, carbon pricing, Climate change policy and tagged carbon pricing, emissions trading scheme on 11/09/2013 by adamwhitmore.